Urban Chickens Network blog: hello Spark listeners! 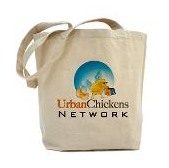 Glad to have you all here on the Urban Chickens blog! As you can see in the post below, we're still egg-less, but hopeful the day's coming soon when we'll reach into the nest and get our first egg. I had a lot of fun talking with Nora Young (the host of Spark) about what it's like raising chickens here in Redwood City, but radio being radio, there wasn't time for everything to be shared. If folks have any questions, feel free to post them in the comments here and I'll answer them as fast as I can. Also, be sure to check out the blogs of the other chicken farmers I know in the blog roll list to the right (scroll down a little)... I've learned a lot from reading them, and we've all got our own perspective on what it's like to raise your own chickens. Oh, and lastly, if you're interested in getting into this yourself, do give the folks at Omlet a look-see. They've got a great design in the Eglu that's made my own entry into the world of backyard chicken farming a piece of cake. Tell them Thomas and Spark sent you! Well, prepare to be surprised! The girls and I were on the radio this morning as part of the debut episode of the new CBC radio program Spark - Tech, Trends and Fresh Ideas. Saturdays at 4:00 p.m. ET and is available via podcast, too. (on the iTunes-hosted podcast) the segment we're in starts at 19:05 and my interview (with the chickens in the background) starts at 20:20 and goes to 24:38. The girls get their clear clucking credit at 26:09. Back to the chicken farming! I listened to the Omlet and chicken segment, including your phone interview. It sounded like it went well. Good job with the pullets. I didn't know you were working on gardening as well as chickens. I'm downloading the podcast now, and looking forward to listening to it! I noticed today that my one pullet, Maisy, seemed to do the "crouch" with me today. You know, that sort of squatting/crouching thing they're supposed to do for the roo when they're mature. I'm hoping this means I'll find an egg in my Eglu nest box any day now! Thomas, that was a great interview on the Spark podcast! I listened to it this AM, then went out to clean the Eglu, which I usually do by just opening up the hatch over the nest box. When I opened it up, there was an egg! Hooray for city chickens!!! Just wanted to stop by and say hi, (see above!) Be sure and let us know when the eggs appear!